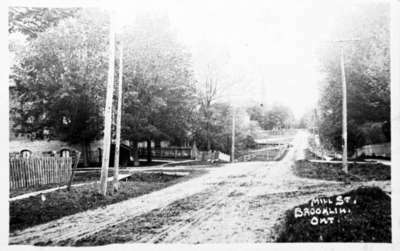 A black and white photograph of Brooklin Mill Street looking west from Church Street. The mill was built in 1848. The Masonic Hall was built in 1871 on the north side of Mill Street (Cassels Road). The Methodist Church was built in 1867 at the south east corner of Mill and Princess Streets. Bottom Right: MILL ST. BROOKLIN. ONT.